Vertical Spread - What Does It Mean? 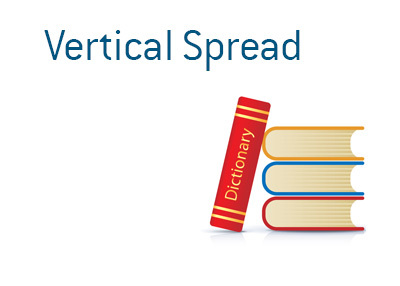 What does the term "vertical spread" mean in the world of options? What is meant by a vertical spread? In the options world, a "vertical spread" occurs when a person simultaneously buys and sells calls of a different strike but same expiry (call spread) or simultaneously buys and sells puts of a different strike but same expiry (put spread). These vertical spreads can be for a debit (you pay) or a credit (you receive money). For instance - let's say that you believe that a stock will either remain stagnant or trade slightly lower for the next month. You decide that you are going to sell a call spread (bearish call spread). In order to put this trade on, you need to sell a more expensive call (lower strike price) and buy a less expensive call (higher strike price). You are limiting your profits (your maximum profit is the credit that you receive), though you are also limiting your downside as well (this is calculated by subtracting the difference in the higher and lower strike prices and then subtracting the premium received from this number). If you decided to just sell a call, for instance, you would be exposing yourself to potentially unlimited risk. Let's look at an example of a vertical spread. Facebook is currently trading at $115 per share. You decide that the stock is likely to remain stagnant over the next month. You decide that you are going to put on a bear call spread. You decide that you are going to sell a call option with a $120 strike price and purchase a call option with a $125 strike price. The options will expire in one month. You get a credit of $2.00/contract for the trade. That is your maximum potential profit. Your maximum loss is $3.00/contract - this would occur if Facebook trades over $125 per share by the time that the options expire ($125 - $120 - $2.00 premium = $3/contract). Your breakeven on the trade occur if Facebook closes at $122 by the time that the options expire. Anything higher than that and you would lose money on the trade, while you would make money if Facebook closed at $121.99 or lower.